Allen Iverson net worth, career earnings and salary: Allen Iverson is a retired American professional basketball player who has a net worth of $1 million dollars. 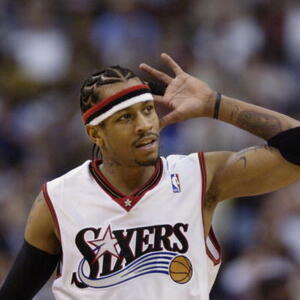 Allen Iverson was born on June 7, 1975 in Hampton, Virginia. He briefly attended Georgetown University before being drafted by the Philadelphia 76ers in 1996. He eventually went on to become an 11-time NBA all star and one of the greatest point guards of all time. Iverson was a controversial player both on and off the court. He was originally recruited straight from a Virginia jail cell by Georgetown University head coach John Thompson. 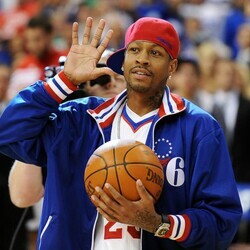 Iverson had been arrested for his involvement in a bar fight and faced a lengthy prison term. Thompson intervened was able to convince a judge to release Allen into his custody with the agreement that Iverson would attend Georgetown, play basketball and graduate. Iverson left Georgetown early against his Thompson's wishes and began a very successful career as an all star NBA point guard. Towards the end of his career Iverson had been largely shunned by American NBA teams and was forced to lace up for the Turkish Basketball League and the Eurocup. During his NBA career, he was the top scorer four times between 1998 and 2005 and holds the record for 2nd highest per game scoring average behind Michael Jordan. On February 14th, 2012 a judge in Georgia ordered the seizure of all of Allen Iverson's bank accounts in the wake of the former superstars claims that he was flat broke. This was a shocking revelation considering that during his playing years Iverson earned nearly $155 million in NBA salary alone. And that figure does not even include the amount of money Allen brought home through endorsement and merchandising deals which is estimated to be an additional $60+ million. 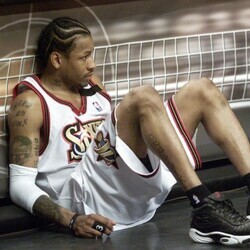 Iverson's financial troubles are an unfortunately familiar story for many professional athletes. He allegedly traveled with an entourage of as many as 50 people at times. He showered friends and family, especially his mother, with cars, jewelry, houses and expensive vacations. Allen's most recent financial troubles occurred after a judge ordered him to pay $900,000 to a Georgia jeweler but apparently the former super star does not have the funds to cut the check. In a December 2012 court filing, Iverson told a judge in Georgia that his monthly income was $62,500 but his expenses were $360,000. Of that $360k, roughly $125k went to paying back various creditors and another a large chunk goes to mortgages. Iverson also admitted to the judge that he was still spending $10,000 a month on clothes, $10,000 a month on restaurants/entertainment and an additional $10,000 on groceries. In 2001, Allen signed a very unique endorsement deal with Reebok. In addition to paying $800,000 a year for life, Reebok set aside $32 million in a trust fund that Allen will not be able to access until he turns 55 in the year 2030. This deal came to light when Allen's ex-wife filed for divorce. As a result of the divorce, Allen will inherit half the trust fund in 2030.